The Selecta Division of Silvan Australia has further expanded its range of diesel fuel delivery solutions with the release of a diesel hose reel, which is designed and manufactured by the leading Italian company Piusi. The hose reel is designed to be bolted to a supply tank or on a fixed point or structure close to the stored supply using its pre-drilled mounting plate. 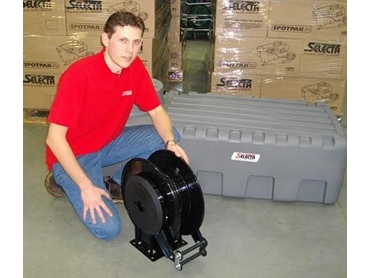 As a spring rewind reel, it is designed to hold a 10-metre length of diesel delivery hose using industry standard inlet and outlet connectors. The sturdy diesel hose reel is compact measuring only 250mm in width and 550mm in height with a weight of 18kg, offering convenient diesel delivery as well as hassle-free hose rewind and maintaining a delivery hose system in a neat and tidy condition. Selecta spokesperson Leigh O’Rielly says there is a growing trend by farmers and industry users of diesel fuel to create efficient storage and delivery systems. “Our Piusi diesel hose reel is the latest addition to the Selecta diesel range, which includes a choice of metering, measurement as well as transfer pump and delivery options. “These complement the Selecta Dieselpak range of fuel storage tanks, which range in size from 100 litres to 2,200 litres in storage capacity. “With the rising costs of diesel fuel there is a definite trend by farmers and other diesel users to properly manage their needs for cost control, job or task cost allocation and minimising waste or losses.